"…anything short of the absolute pursuit of science cannot be accepted or tolerated." | Watts Up With That? "…anything short of the absolute pursuit of science cannot be accepted or tolerated." 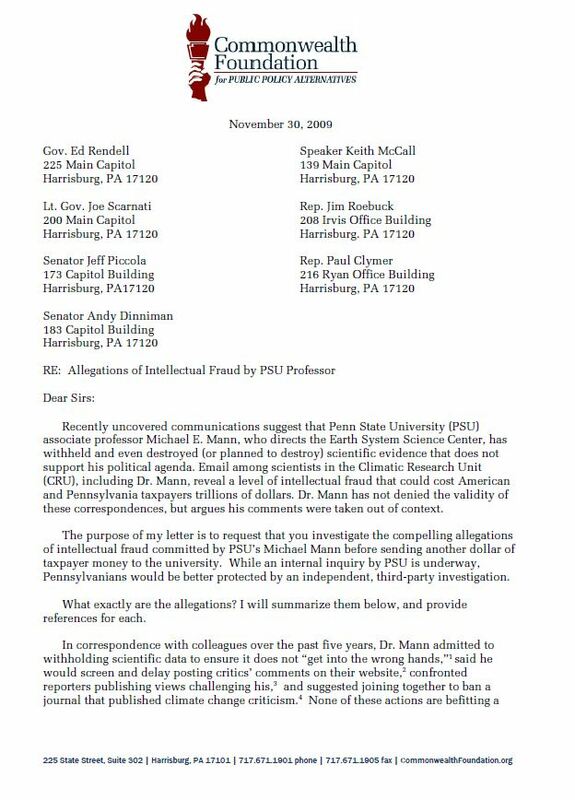 While Dr. Mann has made statements in the press during the last week to the effect of “I welcome this investigation” I wonder if he’s seen some of the correspondence being sent to PSU regarding him. Here’ s one from Pennsylvania State Senator Jeff Piccola that has some very pointed language. December 15, 2009 in Climategate. ← DOE sends a "litigation hold notice" regarding CRU to employees – asking to "preserve documents"
Looks like he is giving the U time to get to the bottom of it before it becomes a matter for a Hearing. Which climate researchers have taken oaths before giving testimony to legal bodies? Wouldn’t lying under oath constitute perjury? Wow. Now things are really getting interesting. Senator Piccola was quite restrained in his communication. Perhaps he should have suggested that President Spanier visit wattsupwiththat.com for a more complete picture of the types of “infractions” to which Mann might have been a party. Otherwise, he is spot on by pointing out that the consequences of not being absolutely honest are far-reaching and potentially devastating. While I’m all for investigating Mann and of the whole group, he’s the only one I would apply the f word too, they are investigating the wrong thing. People know the first hockey stick was broken by McIntyre, however the 2008 and 2009 hockey sticks are far more disingenuous. They should be asking him to explain how throwing out data that doesn’t agree with his conclusions isn’t fraudulent. Wow, the reals are really starting to come off the wagon, aren’t they? Investigations and other legal manouvers play the role that demons did in old gothic tales – once invoked, they cannot be uninvoked and they soon take on a power all their own. This entire game dependend on it staying hidden inside a black box – the machinations cannot withstand the disinfecting light of day. And today Russia and China are holding up the Copenhagen conference with outrageous demands. (China wants a guarantee of no outside inspectors, and Russia wants carbon credits for every dying old soviet factory that was shut down in the 90’s) But if you truly believe in Thermageddon, how can you refuse to give Russia and China everything they ask for since without them you have nothing? Neither of those countries care whether there is a final deal or not, so they can hold out and refuse any deal unless they are bought off at an exorbitant price. Why shouldn’t they? Thinking that Russia and China were going to “play nice” at this conference just may turn out to have been the biggest and most foolish conceit of all. @Invariant – It’s a garbage article with simple statements with various levels of truthiness. Not all of which have anything to say about wheather our current changes in climate is natural or not. Not the type of thing that I think would be worth highlighting on this site. I’m not holding my breath. They will circle the wagons and hold fast unless funding is actually withheld. I’m not holding my breath over the chances of funding being held, either. I like Senator Piccola’s subtleness, if you could call it that. LOL. This is the type of action I was hoping to see when climategate broke. Hopefully he’ll keep pushing if the internal investigation is a whitewash. Well, well, well. I still have the text of the response letter I received from you a while ago regarding my concerns with climate change. Would you like me to send it back to you to refresh your memory? My position stands as before. I am a registered Democrat. Liberal in my views of my fellow humans, conservative in my own way of life. I have voted the Democratic ticket almost exclusively during my entire adult life. But this climate change business has turned out to be a water shed event for me. Tell me, what say you now about climate change? Still want to hang your career on it? Because in truth, if you do, your career will surely be hanged by it. The AGW fraudsters are going to have a hell of a hard time sweeping this dirt under the carpet. If only something like that would happen here in Norwich (Home of uea CRU ). Instead of police investigating the obfuscation and stated aims of frustrating the Freedom Of Information laws we have an investigation into how the emails escaped into the net! Leaves little doubt about the seriousness and urgency of the concerns expressed. Now, what about the states that have already placed thier economies under Cap & Trade laws based upon the critical findings of a compromised CRU? CLIMATE CHANGE IS NATURAL: 100 REASONS WHY with commentary. The Senator’s letter in quite serious in tone, and I don’t doubt an investigation would be full of powerful language as well, but politicians have a habit of talking the talk without walking the walk. I’m glad that they are taking this very serious !! This is good news. I seriously doubt that Penn State’s funding is in jeopardy–and it gets hundreds of millions in research dollars–but its alumni won’t give if they feel Mann is making a Penn State degree look bad. My beloved college’s statement on Mann portends a whitewash of all facts and an exoneration just like in 2006. They don’t even address the files showing poor science (and worse) in their statement, just the emails that were “stolen”. Central Pennsylvanians and Nittany Lions are a conservative breed though, despite the leftist tilt of the University setting. Dr. Mann will not long endure what is to come for him in ridicule and derision. Another institution better be on his wish list. “Please inform me of the Penn State’s internal Investigation” – are they likely to jeopardise themselves in any way? The internal investigation will be a whitewash. … and those are the milder ones. It’s probably not politically astute to throw those out at a state senator who can significantly influence PSU’s funding. It would be interesting to see him try however. I’m sure it’ll all get sorted out at the Penn State summit in Steubenville. If the potholes on the turnpike have gotten fixed so they can get there…. Fair and correct. Science is not to be adulterated by politicking and opportunism, it is far too important for that. I support a total rework and investigation of the status and validity of current so called consensus. The politicians never let slip an opportunity for partisan gain. If the integrity of this IPCC gang is subject to the crucible of public hearings, I am all for it. Climate science needs a purge of advocates masquerading as scientists. I suspect CRU/EAU made a significant error when they involved the authorities by labeling this leak as a criminal hack. In doing so, they validated the contents and placed them in the possession of law enforcement, and likely provided a complete chain of custody for the materials and it’s context in their interviews. The materials may indicate criminal activities – which will eventually be questioned. When that questioning comes, it will have both the validated documents and their various interviews as relevant material for the investigation. In the US, we refer to that as a perjury trap. It would have been far better for CRU/EAU to simply issue a no comment or refuse to discuss the confidential matter. If they had done so, then every expose from that trove of documents would have to cross-checked and validated independently. The short term, public relations advantage of the “hack” meme may in the long term come back to bite them. Whyyyy couldn’t he be a lawyer?! Ouch ! The senator is serious, no mistake. PSU will find it difficult to whitewash their investigation. And Pamela . . . Go girl ! I’ve saved copies of these letters in a directory I’ve called ‘Fall of Mann’. It is highly entertaining watching this develop. The smugness of Mann has always been irritating. And to recall the number of RC sycophants who regularly called for ‘deniers’ to be taken to court. Ho, ho, ho. I’ve saved these letters in a directory I’ve called ‘Fall of Mann’. The developments are highly entertaining. And to recall how often RC-sycophants have called for “deniers” to be taken to court. HO, ho, ho! Was there a second page to the Commonwealth Foundation letter? I would be very interested to see who the author of the letter was and what the grounds he stated were. Maybe it is just my browser (Safari). Cheers. Included in the definition of hubris is that bit about retribution. So, after a couple decades of the sweet side of hubris, comes the balancing out. Wonder how they’ll feel after a couple decades of funding reductions/cuts and investigative hearings at mutiple levels of government. The lawyers are going to have a field day. Mann got off easy after the Wegman Report. Not gonna happen this time. On top of that, expect to see that issue come back to haunt him. This time there’ll be no dismissive ignoring of calls for data. Good find. So we know who to sling in Jail with Mann and pals then. Not another dollar, pound or quatloo for any of them. With-hold your taxes until they are behind bars. Agreed. I took a closer look and found that I did actually disagree with at least 50 of the statements. I wonder what is the purpose of the article? I’m inclined to agree, but if the academics will not enforce academic integrity, and if they are feeding from the public trough, then public scrutiny, aka investigation, is fair game. If I were anything to do with the administration of the PSU I would be trying to escape responsibilty for the consequences of Prof Mann’s work at my university. I would be trying to demonstrate that if Prof Mann has been involved in fraud it was completely unknown to me and that once I knew about it I took all reasonable steps to protect innocent outsiders from what might have happened inside my institution. The problem is that Steve MacIntyre has been questioning the methods fo Prof Mann in public for many years and it was unreasonable not to have had an investigation into the work of Prof Mann earlier when these problems first surfaced many years ago. I have previously thought our unsubtle, gun wielding, cousins, across the pond to be a bit of a liability, but I would just like to say a hearty thanks in advance for saving the world from AGW nonsense. American voters actually have some power. Unfortunately, the same cannot be said over here. I am proud of the efforts of Monckton et al, but I think that the yanks will be the first to stand up and be counted when it comes to rejecting this fraud. I hate to dump cold water on this celebration, but this appears to be Republican related politicians, threatening a school in (democratic) PA, while they are the minority party…. I saw a distribution on this of Republican Senators and it was signed by the Minority Something or other… There are 40 of these guys and gals, fairly toothless at the moment, in the US Senate. How many Dem’s will cross the aisle to help them “punish” a University, helping the Dems to raise Billions??? This letter might have more substance behind it if there was any Dem Senators backing it, you know the other 58,59,60 guys and gals, depending how you count it… If they send a letter saying they are sure, wink, wink, that PSU has the highest standards and will look into this wink, wink as it deserves, well, this letter may be wasted carbon! I might get more excited when a Democrat senator makes a stand. So far, the debate is polarized along the usual fault lines. “A British newspaper today published a list of “100 reasons why global warming is natural”. Republicans control the senate in PA.
P.S. And those Republicans haven’t yet supplied PSU with this years funding. A couple of years ago I wrote the University of Arizona to point out that they were blocking Steve McIntyre from downloading data. They promised to look into the matter, and perhaps it was rectified. I just sent them my old correspondence, as well as some climategate emails with their researchers discussing concealing data. Hopefully, universities will start to enforce some higher standards. Senator Piccola is a PA State Senator, not US Senator. Currently the MAJORITY party in the PA State Senate is Republican. Democrats have only a slim 104-99 majority in the PA House of Representatives. Penn State University is a Public Institution that gets funding from the Commonwealth of PA. Seems Republicans have a majority in the PA State Senate while Democrats have a narrow majority in the PA State House. This is the state legislature in action, not the Federal level. Pennsylvania happens to have a Republican controlled state senate. This happens to have teeth. The state is the funding source for Penn State. As such, the State could cancel funding to the University, until it cleans up its Mann based climate issues. The first letter is from the Chairman of the Education committee. He was letting his majority know he was focused on the topic. If I was Mann, I would be seriously worried. Pennsylvania is only Democratic in Philadelphia and Pittsburgh, the middle of the state in overwhelmingly Republican. Even State College, with its Democratic University types is dwarfed by the surrounding Republicans. The Blue/Red map is pretty dramatic. Left-leaning Academia is not very trusted in an environment where the jobs are disappearing anyway. Sort of like being in a farm house surrounded by Zombies, I suppose. (From their perspective). Monash University publishes volumes of unsubstantiated alarmist tripe. A search on Monash gets 6 hits in the ClimateGate documents. I wonder if there’s any money flow involved here as well ? Very good letters! Including the one Pamela posted in the comments. Now, who was the UofA fellow involved again? I live in AZ. I’m an engineer. I will write to the UofA and the state legislature (which has a Republican majority right now) and tell them the same thing about that fellow. Thanks in advance. I sent him a letter some time back on this subject and go the usual boiler plate. who can think for themselves-which is what we need…. Jeff Piccola isn’t a US senator he is A Pennsylvania State Senator and the chairman of the commitee that funds PSU. You are mixing up Sen Inhofe with the PA State Senate. Also Note that the Rebuplicans have a 30 to 20 advantage over Dems in the PA Senate. What most people don’t understand about PA is that because of Philly and Pittsburg’s Populations Governor and Presidential elections tilt Dem, but when it comes down to districts in PA most of them are Republican, so that is why you get a typical power split in PA.
Hopefully, somday it will make a good book. I even have a title. The Rise and Fall of Mann. With any luck and an interested prosecutor, the fall could be very enteratining. One would hope that they bring back coperal punishment… By hockystick!!! My popcorn is ready, lets get the show on the road! >>with various levels of truthiness. I disagree. It is a good article, as it is laid out in simple sound-bites for the common people, and it broadcasts a very different view of s0-called Climate Change. Let the Warmists debate some of these points, if they wish, for that is what we want – debate. At last, some readers – ordinary people – will begin to realise that there is an alternative view. The science is not quite so settled. Let’s have the debate in public – bring it on. Dave. This ordeal is the Pensylvania Senate. State med schools, engineering schools and all other departments hustle for limited dollars. I read the 2 letters and it is clear that the chancelor will act on this. He may lose his job also. It is very likely that Mann is history. This may be a requirement to restore partial trust in the school. Spanier comes from Nebraska. At land grant schools, they are dependent on Ag giants for research and funding. 750 million research dollars a year. materials science and industrial research are top notch. Mann is most likely a bad odor they will want to get rid of soon. No I doubt the President of the school system is at risk. He is going to fight a lot of fund raising crisis in numerous departments. I wonder how much black soot Mann’s career will emit when it goes up in flames? Please note that the letter is from a Pennsylvania State Senator not a US Senator. The Pennsylvania Senate is made up of 30 Republicans and 20 Democrats. If the Pennsylvania Republican State Senators wish to make an issue of this they certainly have enough of a majority to do so. I would actually argue that the PA State Senate venue would be the best place for “turning the screws” to what Prof. Mann has done. They can subpeona his work and data, call him before a hearing and bring in expert statisticians. All the security is already in place at Copenhagen. Just keep the lot of them there and turn the conference centre into an enforced stay hotel while the investigations run their course. It’s winter, so not a snowball’s chance. LOL You’ll just have to wait till like May or June! Just don’t break an axle on your way there. Denis Hopkins (10:37:12) : I echo your sentiments. You might try contacting the editor of our local paper with your concerns, and see if you get a reply – I didn’t (twice)!! Lord Monckton has said he will be paying Norfolk Police a visit as soon as he gets back from Hoxenhagen, I wonder what sort of reception he will get? If I knew when he was going to be there I would pay a visit – just to shake his hand! PSU is not a national university, and AFAIK the only national universities in the US are the military academies. PSU was chartered by the State of Pennsylvania and receives much of its support through state funds. The makeup of the US Senate has little bearing on what the State General Assembly chooses to do regarding PSU and Mann. Sen. Piccola (R) is the Chairman of the Education Committee in the Pennsylvania General Assembly (Legislature). If you had read more carefully, you would have seen that Sen. Piccola sent a courtesy cc to his Democratic Party counterpart on the Education Committee, Sen. Dinniman. There are 30 Republicans and 20 Democrats in democratic PA’s State Senate. Sen. Piccola’s letter ought not to be taken lightly by the University. When the history of the Great Global Warming Scam is written in the years ahead, again and again future historian’s will come back to to a text book study on how [ perhaps] just one person with a conscience, using the the power of the all pervasive World Wide Web, completely destroyed one of the greatest scientific scams in history. Earth’s people may well owe that person a moral debt that can be never be fully repaid in any one lifetime. Penn State is in a recent boom in energy. The marcellas shale is leasing at high rates. Oil and coal are great revenue sources. The fundraising campaign is ambitious. alumni and friends have enthusiasm that is easy to freeze. I spent last Saturday in another fine school. My daughter is a top NCAA athlete and extremely high ranking merit scholar. Her offers on graduation were from strong alumni. I know people by name than make 5 million dollar donor phone calls. It is so easy for a couple of fans to chat at a table in a golf clubhouse and pass 30 million to some other aggressive institution. I can make a few calls, but I suspect Mann has been severed. He seems to have free time and have been relieved from classroom contact. departments can be passive aggressive and not fire a trouble maker. They just move the office to a broom closet and give a sabbatical and send him on research in the field. I can look it up, but the school of climate scientology is an adversary to many agriculture industrials as well as automotive. Lord Monckton pulls no punches. If you haven’t seen this its a must. Will Sen Picolla get his witch? Lets hope not. …Don’t bother. I have read the article, and it is one of the worse-written articles in a so-called “scientific” journal that I have ever read. Also note that most of the comments have been deleted. Denier articles like this undermine the nonalarmist movement. Why would someone bother to do such an amateur job? My first instinct when I see junk like this is sabotage – i.e. an extreme alarmist posing as a “nutjob denier” with the intention of undermining credibility. I think alumni should send the same letter. That is one thuggish letter from Piccola. And a threat he couldn’t deliver on. But I’m just sort of repeating what Paul Vaughn just said. If the term “denier” is forbidden, I suggest updating the “Policy” page. I do not wish be in violation of policy, but in complete honesty, I would have to guess at what is considered acceptable context. My intention is not to create administrative burden, but rather to avoid misunderstandings. Best Regards. Not sure “the CRU/EAU made a significant error when they involved the authorities”. If there was a suggestion that a crime had been committed, they didn’t have much choice in the eyes of the law. The leaked emails and their consequences will be pursued by at least two formal processes in different jurisdictions, running broadly in parallel. There are many paths for information to leach out, and numerous”higher authorities” to refer to, should further investigation be warranted. Warranted by either investigation, or by interested parties in the wider community. The investigators do not really control the process. They will understand this, and the risks of “taking a wrong turn”. We have good reason to feel confident in the outcome. OK – it will not pan out quite that way. It seems almost inevitable that somebody will be unsatisfied with the outcome of the initial investigations. But that’s not something to be concerned about. It will just keep the issue under the glare of public attention for a longer period. Public pressure will bring promoters of MMGW into the spotlight to explain and justify their ideas to a wider audience. It will be an audience with increasing awareness of the issues and the controversy. And the public arena is no place to drown out the voices of those who disagree – there will be an improved outlet for sceptical opinion. We can see this happening already. A promoter of MMGW having a moan in “the Economist” for having to explain their ideas. Even if it is galling to read, “New Scientist” trying to put down sceptical opinion only helps to build the platform of public awareness upon which the debate will be played out. Apropos the Copenhagen agenda, Roger Harribin, the BBC environmental analyst, mentioned one of the desired outcomes was ”… change to political systems.” Harribin didn’t expand on this sinister point but I wonder if such ‘change’ is destined to move us in the direction of dictatorship or democracy. Or, to put it another way, will we get a referendum in every country on what has been conspired at Copenhagen, or will we be told that ‘denial’ or opposition is a criminal offence? Mann must be scared, or he wouldn’t have lashed out at Jones the other day. I wouldn’t expect any prompt remedial action against Mann, however. As a tenured employee, he has a “property interest” in his employment, and a “liberty interest” in his “good name,” protected by the Due Process Clause. That means a long, slow, drawn out process, including a full-blown hearing, not greatly unlike a civil trial. Sort of like the Ward Churchill fiasco. They may not even dare to relieve him of his duties, given the “stigma” that would place on his reputation. I’m sure the lawyers here could explain this business much more accurately. It will be very much harder for UPenn to let Mann off the hook now that doubt has been sown in the mind of the public – the graffiti there speak. I think that the politicians and businessmen will throw all their scientists under the bus as scapegoats. Keep a watch on fat cat Pachauri (read Delingbole), and the millions he stands to make with carbon credits. He’ll cut his losses pleading scientific innocence on grounds of being only a railway engineer. Another scientist who will have to go IMO – Wei-chyung Wang from Albany University. I wonder if it is Keenan’s pretty well proven allegation of fraud against him, in the paper written by himself and Jones, that is linked to the DOE call today. See this email and reflect. In the DOE Carbon Dioxide Research Program, Wang was the Chief Scientist. I expect a whitewash job that would make Tom Sawyer proud. Nothing will happen til after the 2010 elections. The question is can the party in power find enough rug between now and then. Probably a good thing I’m not in charge. Do you really think people are going to put up with being taxed until their eyes water on the basis of half baked science from known frauds? IPCC cheif Pauchari is the head of TATA, who own CORUS, who just shut down the jobs of 5000 decent hard working people so they can cash in their £90M in carbon credits those peoples tax money bought them. Wake up and smell the stench of corruption. Then act for us, or we’ll sack you. departments can be passive aggressive and not fire a trouble maker. They just move the office to a broom closet and give a sabbatical and send him on research in the field. Great idea. I suggest north Siberian tree ring studies. This winter. A lot will depend on the sophistication and resources employed by the Pennsylvania State Senate in conducting an investigation of Michael Mann. A frontal assault on the “science” of AGW will be unproductive. A far more probing inquiry can be conducted of the instances of dishonesty, violation of academic standards and lack of supervision of and by Dr. Mann. The point should be that arrogant clowns like Mann are out of control, lie and cheat, believe they aren’t accountable to anyone, and likely have very, very little supervision. Since those complaints go to the heart of the issue of whether state funds should be appropriated to Penn State, that should chill university administrators to the bone. There are many excellent lawyers in Pennsylvania. Hopefully some of them will be retained by the Education Committee of the State Senate to assist with any inquiry. It is the corruption of the scientific and intellectual process which is the crime here. And the crime is most certainly real. And I can’t help saying it: There is a consensus on this issue. As a follow-on to Jean Parisot’s (11:04:55) posting, I’d like to add the following. I have served in four Police Forces (Services in the UK) one overseas and three here in the UK. I have been privileged to meet and, on one occasion, work with Officers from the Norfolk Constabulary. They impressed me with their tenacity and rigour during their investigations and they gave the impression that any attempt to apply pressure of any description to achieve or hide any result would be strenuously resisted. Now that they have in their possession the entirety of what was allegedly stolen/hacked, given by the alleged victimised entity (the UEA) as the genuine material I am sure that their investigations are going to take many different routes. A couple of nice, juicy Conspiracy to Avoid a FOIA Request charges coupled with a few more Conspiracy to Defraud charges, all backed up by certified genuine documents supplied by the employers of the various villains would be a doddle! They’ll go for it, make no mistake, because they won’t make any. They’ll take their time and then they’ll present a meticulous case. I look forward to the trials! This is really one of Monckton’s best. He names the crooks and their deeds. Very clearly. Also, as the street U-tube showed, he’s got ability to engage with Greenpeace activists with clearly opposing evidence without resorting to, or provoking, raised voices – a very precious skill. One of the last great hold outs from the medieval times is the supposed rights of scientific institutions to examine and pass judgement on their own tenured employees. Compare the screams of outrage from every quarter that would have occurred if Ken Lay of Enron and Bernie Madoff had been examined and judged solely by those who were closely associated with them in the stock exchange and who had benefited most from their activities. This is the exact same situation that East Anglia University and Penn State University are currently in. Both universities have benefitted very substantially in both financial and status as have a lot of those employees of the universities directly and indirectly by the past activities of the global warming science scammers within their hallowed walls. Unlike Ken Lay and Bernie Madoff who scammed billions of dollars from tens of thousands of individual investors and institutions, the university employed warminista and activist scientists whose activities have finally been exposed, have created a political, social and economic situation across the entire planet where literally the lives of billions of people and immense national wealth situation is being expended on a claimed global warming scam the scale of which has never been seen before, a scam we now know is based on mostly contrived, manipulated and openly fraudulent data from these same climate scientists. And the close compatriots of the scientific scammers, the ones who possibly have indirectly benefited the most from their activities are the ones who get to exam and pass judgement on these same science scammers. Would this be tolerated in any other important aspect of our society? Really doesn’t make any sense to me, unless “climate change” and “human activity” are both euphemisms. it is one of the worse-written articles in a so-called “scientific” journal that I have ever read. The AGW cult isn’t circling the wagons, they’re circling the drain!! How is the Goreacle going to be implicated in all this???? I like the use of the word “denier” (pronounced ). It refers to the quality of a stocking, as commonly worn by ladies. So when will these guys show up in the incarcerated TV reality shows banging on their cell windows? Not an expert on stockings, but isn’t it DERNIER? Here’s a hockey stick for you! Over time, my irritation with nose-ringed Oregon Dems toeing the line instead of learning discernment has risen quite sharply! Listen up Wyden, Merkely, Wu, Blumenauer, DeFazio, Hooley, and all the rest of Oregon’s Democrats in politics, including the list of Oregon State Democratic senators. Do not dismiss me with talking points. I am a registered Democrat and I know how to wield a poison pen. I will use it if you people continue to drink stupid juice! good! I hope he provides them with plenty of evidence about what a fraud the CRU is. Could take decades to untangle the money trail – oh well. Can we keep journalists and NGO reps there as well? Eight hours to get in and a decade or two to get out. Climate justice we can all believe in. 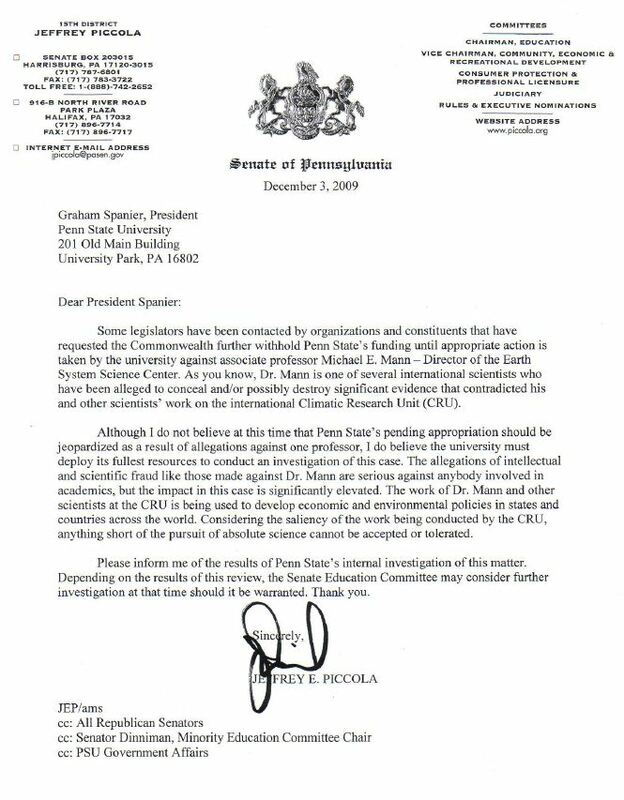 The State Senate Leader is openly calling for an investigation into the activities of Michael Mann, drawing attention to clear evidence of scientific and academic misconduct. While I think PSU will lay great store by its commitment to academic freedom (and rightly so), it cannot afford to ignore the warning signs from the people who help funnel money for its research. Assuming that the momentum of “hits” on this blog keeps up, I can predict safely that the total hits well exceed 30 million (!) on or before Christmas Eve. @ Harry Eagar (13:19:03) :That is one thuggish letter from Piccola. And a threat he couldn’t deliver on. Don’t be so sure. The Republicans in the PA Senate love to cause problems for Ed Rendell. They could make life very, very difficult for Mann and even Spanier if they wanted to. Penn State needs money. This could really hurt them. Spanier would be wise to cut Mann loose. Piccola isn’t playing around and the state Republicans could really put the screws to him and the university. There was a somewhat similar scandal in the field of history 7 to 8 years ago concerning research and a book by historian Michael Bellesiles, which purported that guns usage in America was rare prior to the Civil War. Emory University, at which Bellesiles was a professor, was finally pushed into investigating him after numerous questions arose. Anyway, I thought you might like to see how a University responds when it is clear their golden boy is going down the tubes. BTW, the liberal community loved Bellesiles’ work (it suggested that the purpose of the Second Amendment was not to give people the right to bear arms, but strictly militia). One of the primary people who brought him down, James Lindgren, is an AMATURE historian whose degree is law. Most historians WANTED Bellesiles work to be true, and ignored the gross errors. Yeah Oregon….and you DEFINITELY do not want to piss Pamela off. Meanwhile, back in PA…keep the pressure on ’em, boys!! This PSU alum is embarrassed. There is no room at our great university for Mann and his type of politically-motivated moral relativists. Scientific integrity must trump politics. As a Pennsylvania resident, I think Penn State University should open a satellite campus at the federal facilities in Allenwood or Lewisburg. Professor Mann could be transferred there. Professor Mann could teach the residents about global warming. When the students get out, they would qualify as Democrat politicians. Plenty of money there. Professor Mann could qualify for parole, but it should be based on restitution to the taxpayers of both PA and the US. For non Pennsylvania residents, Allenwood and Lewisburg are prisons. Nic (15:33:49) : ). “denier” … refers to the quality of a stocking, as commonly worn by ladies.It refers to the quality of a stocking, as commonly worn by ladies. Base “F” (15:58:01) :Errr….Nic……Not an expert on stockings, but isn’t it DERNIER? I do so hate controversy. Can’t we all just get along? Are either of these, by any stretch of the imagination, “Reasons why climate change is natural”? I’m cherry picking here, but that’s what the warmists will do, too. @TA Yeah, cherry-picking. and Yes, the warmists will as well, so the science refuting all of their idiocy must be much better – better researched, better syncronized and better presented. I have decided to drop New Scientist, any suggestions for a better journal? …Sorry, no suggestions. That’s the trouble with the corruption of scientific journalism -you never know how far it reaches until you’ve wasted a lot of time being deliberately misled by vested interests. 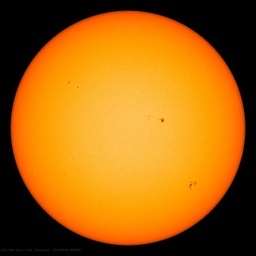 CBC IS HAVING MICHAEL MANN ON TO DISCUSS GLOBAL WARMING. I HAVE SENT A COPY OF THE ABOVE LETTER TO THE INTERVIEWER IN THE ODD CHANCE THAT SHE MIGHT ASK SOME LEADING QUESTIONS. Echoing Anthony, Douglas DC, and savetheshark — Go, Lady Pamela, go! Patrick (21:10:21) : As a Pennsylvania resident, I think Penn State University should open a satellite campus at the federal facilities in Allenwood or Lewisburg. Professor Mann could be transferred there. Professor Mann could teach the residents about global warming. When the students get out, they would qualify as Democrat politicians. Plenty of money there. Professor Mann could qualify for parole, but it should be based on restitution to the taxpayers of both PA and the US. For non Pennsylvania residents, Allenwood and Lewisburg are prisons. Love this. :)) Or we can send him to Western Pen–maximum security. It’s right on the river…lots of really big rats, just like him. He can share a cell with Mike Veon…I’m sure they have lots in common. 1. Penn State is actually in a heavily Republican area. Please provide us with a link to the video once it’s available – could be good laugh-material. Funny that Climate Alarmists want to appeal to people like this as the messengers of truth. Clearly Mann was a foolish idiot, for perpetuating this scam, then thinking he could get away with it even as he openly discussed it in e-mails. Nothing better than watching an a-hole who thought he was smarter than everyone else, go down for making such a common and idiotic mistake. Tweedle dee went the fiddlers three. I’m going to see if I can get an honorable mention for Mann, Briffa and Jones at the PA State fiddler’s contest.